Cigarette beetles often infest tobacco products, as well as other dry goods. Adults are most active during late afternoon and on cloudy days. They are attracted to light. 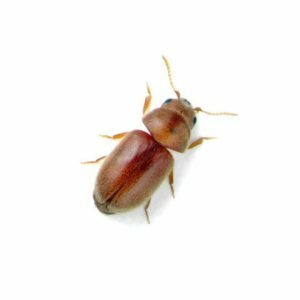 Cigarette beetles cause damage and destroy a variety of dried foods and goods. 1/16-1/8 inch (2-3 millimeters) long. Adults are brown and oval shaped, measuring 1/16-1/8 inch (2-3 millimeters) long with serrated (saw-like) antennae. Tobacco products, spices and herbs, dry pet food, dried flowers, dried fruits and vegetables, seeds and grains, yeast, peanuts, beans, rice, and many other undisturbed materials. Females can lay 32-42 whitish, oval eggs in and around food materials. Eggs hatch in six to 10 days in warm weather. The full-grown larvae pupate in silken cocoons covered with bits of food. Life cycle is 30-90 days with three to six generations per year. Temperatures must be above 65°F (18°C) for development. Adults live for 23-28 days. They are strong fliers. Finding the source of a cigarette beetle infestation and controlling large populations of cigarette beetles is very difficult.